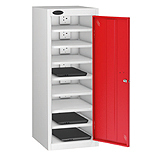 15 shelf locker with plug sockets, perfect for keeping your devices safe and ready to go! 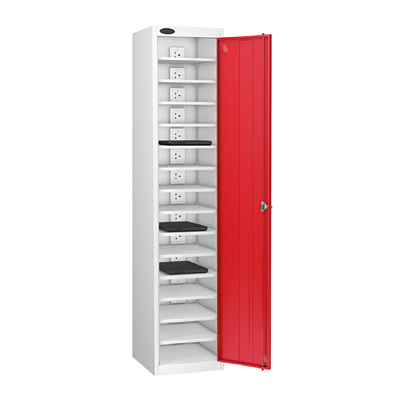 This 15 Shelf Charging Locker is ideal for charging up your electronic items with the peace of mind that they are locked up safe and secure. 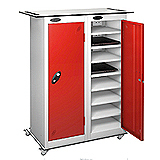 Great for items such as laptops, phones or small power tools. 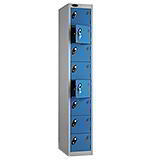 With 15 individual shelves, each with their own plug socket, this Charging Locker can hold and charge a large number of items in one go. 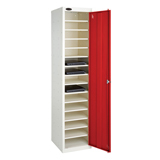 With a welded steel frame and internal door strengthener offering superb security. The antibacterial coating is effective at reducing MRSA and E-coli by 99.9%, helping to prevent contamination. Fitted with a standard cam lock but also available with a hasp and staple lock at no extra – please call us to order this. 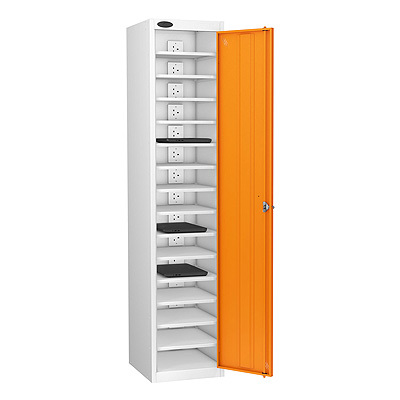 Single door makes it easy to store and charge lots of items at once.